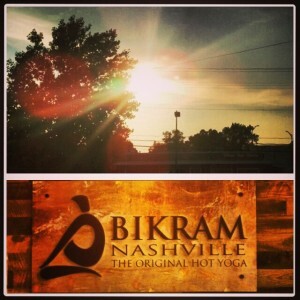 Missing my Nashville studio and Yogis! I apologize for my hiatus from posting. It has been a crazy couple months. My then fiancee Tom Morkes and I packed up all our belongings at the end of June and road tripped back to Washington State where we just got married 2 weeks ago on August 3rd. I’ve spent the past couple months since I posted planning our wedding, keeping up with my own training to stay in shape for the wedding, and teaching classes at Bikram Yoga at The Yoga Element in Bellevue, WA and Bikram Yoga Redmond in Redmond, WA. Wedding workout plan was successful! Now that all the wedding craziness is over, it’s time to get back to work and one of my number one priorities is getting my blog back on track. I’m looking to really revamp it within the next couple months and would love some feedback on what type of information my readers find helpful! Working as a personal trainer I’ve realized many people are very capable of establishing a routine. The problem is many of us don’t have lives that are the same every day. We have obligations at all hours with work, kids schedules to build our own routines around, and business or personal travel that throw even the best intentions out the window. Starting August 21st, my husband Tom and I will be setting out on an adventure to travel the world! We just purchased tickets to visit San Francisco, Hawaii, New Zealand, Australia, South Africa, Argentina, Chile, Peru, Ecuador, and Belize in the next 11 months. This is a short list of the challenges I expect to encounter, but I will be blogging, vlogging, and facebooking on the obstacles that come up and how you can tackle them. I still plan to write about a blog per week on a fitness topic I find interesting. However that being said, I love having topics to research. If you have an inquiry about fitness please send it my way! I’m looking to revamp my youtube channel! (Subscribe! You’ll get notifications when I post new videos!) So far it’s mostly been a medium where I posted the exercise of the day. I plan to start posting those again by next week, but I also have some other cool ideas to make the channel a resource for anyone looking to stay fit, especially those who spend a lot of time on the road. I’ll be posting full length workouts! I miss teaching group fitness so I’m going to start posting workouts! You can stay in shape with me from all the places I travel! I’m going to start the exercise of the day back up! Many of us have an all or nothing mentality when it comes to fitness. We either do our full workout or nothing at all. This attitude can quickly lead to weight gain. Even on the days when you are traveling you have a couple minutes before you shower to whip out 100 squats, or 15 toes touches, or 15 frog jumps. Check out the exercise of the day to mix things up and get in some activity even on your busiest days! These are just a few of the ideas that I’m starting to work on. My goal is to create a resource for you. So feel free to give me feedback! Ask questions. No question is dumb. If you struggle with a certain aspect of your fitness I’m sure others do too. Send me your fitness questions to cjdought@gmail.com! Adventures and Stories of the cool things we encounter. Hopefully some of my upcoming work interests you! Remember reach out to me! I’m here to answer your fitness questions!